The record-setting performance came partly at the expense of their former star, Zack Greinke, who gave up four homers in his start with the Arizona Diamondbacks. Los Angeles a strong chance to become the first team since the 1923 Yankees to lose two World Series in a row and return for a third try. In the next-to-last game of the 1957 season, he became the last Brooklyn Dodger to hit a home run before the team moved to Los Angeles. Just four years after Major League Baseball’s integration, Newcombe won 20 games for the Dodgers. That was the start of an extraordinary club. Newcombe, a teammate of Jackie Robinson’s, was an overpowering righty as a rookie of the year, an M.V.P. and the first Cy Young Award winner. Don Newcombe, one of the greatest pitchers in Dodgers history and one of the franchise's final links to Brooklyn and the days of Jackie Robinson and Roy Campanella, died Tuesday after a lengthy illness. He was 92. Clayton Kershaw, signed to a three-year, $93 million extension over the offseason, was again named the Dodgers' Opening Day starter by manager Dave Roberts on Tuesday. 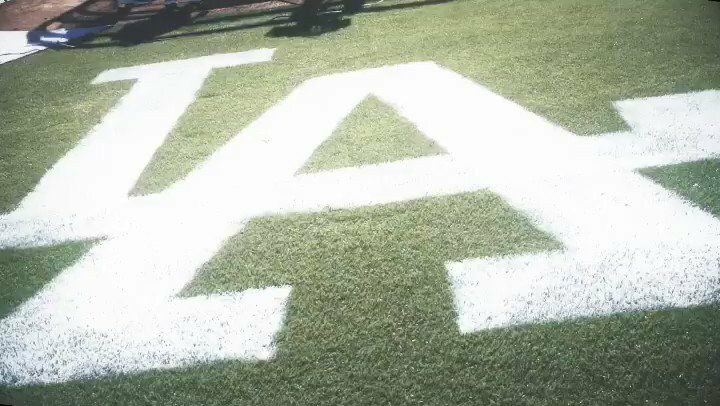 The Dodgers open the season March 28 against Arizona at Dodger Stadium. Clayton Kershaw on Monday was the first Dodger to throw live batting practice this spring, with opposing batters Russell Martin and Josh Thole issuing rave reviews while Kershaw was typically underwhelmed. Dodgers outfielder Andrew Toles will be out indefinitely while dealing with a personal matter, according to the club. Dodgers pitcher Walker Buehler resumed playing catch on Sunday, and manager Dave Roberts said his first bullpen session could be on Wednesday. Every player chases a dream, the chase tougher for some. Stetson Allie, 27, is in his third incarnation, a pitcher-turned-outfielder-turned pitcher in Dodgers camp as a non-roster invitee with a 101 mph fastball. Corey Seager's rehab from elbow and hip operations continues without setback, and the Dodgers shortstop still sees no reason why he won't be ready for Opening Day. Dodgers manager Dave Roberts confirmed the club is "slow-playing" pitcher Walker Buehler early this spring, but insisted Buehler will be ready when the regular season opens. When it comes to prospects, the Dodgers are deeper behind the plate than they've been in decades. The first round of bullpen sessions concluded for the Dodgers on Thursday, and the early leader for maximum buzz was Julio Urias. The left-hander was dazzling in his session, but at this point he has an uphill battle to make the Opening Day roster. The Dodgers know just how good Walker Buehler is and want to keep him that way, which is why he's the only pitcher in camp who hasn't thrown a bullpen session yet. Did the Dodgers, after losing back-to-back World Series, do enough over the winter to get a ring? Andrew Friedman, the president of baseball operations, said there's no shortage of feedback on the question. Kenley Jansen said cardiologist Dr. Koonlawee Nademanee "is the best probably in the world" and it must be true, because the surgeon not only fixed Jansen's heart but also his mind. The Dodgers closer threw a bullpen session Wednesday as if he never had a 5 1/2-hour procedure performed in late November to correct a defect that caused an irregular heartbeat. The 2019 Dodgers are going to be good, and that's in large part thanks to the fact that they're projected to have the best run-prevention unit in baseball. For all the insistence last Spring Training from the Dodgers that they would not suffer from the so-called "World Series hangover" after losing in seven games to the Astros, that's pretty much what happened. The hope, and the goal, is that lessons learned from last year will prevent a similar occurrence this year. Nine years later, the battery of Clayton Kershaw and Russell Martin was reunited on Tuesday as Dodgers pitchers and catchers reported for 2019 Spring Training at Camelback Ranch. It was reporting day for pitchers and catchers on Tuesday, but manager Dave Roberts also addressed the status of the Dodgers shortstop, Corey Seager, who is coming off elbow and hip operations. The Dodgers' spring questions center on the health of shortstop Corey Seager and closer Kenley Jansen. Here's a first look at a possible Opening Day roster. If you trust Justin Turner, you can believe the offseason moves putting A.J. Pollock in the Dodgers outfield will work out just fine. How soon can we expect to see Dodgers prospects Keibert Ruiz or Will Smith in the big leagues? Beat reporter Ken Gurnick answers this question and more from fans. The Dodgers announced the 21 non-roster players receiving invitations to Major League Spring Training camp on Friday, a list that includes pitching prospect Dustin May, shortstop prospect Gavin Lux and catching prospect Will Smith. Considering the players that get the big bucks often get most of the attention when they are signed and drafted, let's take some time to look at the other end of the spectrum. Here are the biggest steals on the Top 100 Prospects list. If management's offseason strategy is successful, the Dodgers will have a better-balanced offense keyed around the addition of A.J. Pollock's right-handed bat. The Dodgers play Yasiel Puig's new team March 14 and 15, plus everything else you need to know about Spring Training. Spring Training is imminent, Opening Day is within sight and the big league season isn't complete for fans without a subscription to MLB.TV. The most comprehensive streaming service in professional sports is now available for the 2019 season. A 79-year-old fan died in August in an accident that has only come to light recently. Her daughter says higher nets could have prevented the death. MLB.com looked at each team's two highest-ranked position players in WAR, according to the Steamer projections. Here are the top 10, but keep in mind that things could change once Manny Machado and Bryce Harper find homes. We take a look at 10 Dodgers who compiled outstanding careers elsewhere but later joined the Dodgers. Some are already in the Hall of Fame, but none is generally remembered for his time in Los Angeles. An exhibition at the Museum of the City of New York — including photographs that have never been published before — shows the pioneering player with his teammates and his family.